Most cases of back pain are mechanical or non-organic-meaning they are not caused by serious conditions, such as inflammatory arthritis, infection, fracture or cancer. The back is a complicated structure of bones, joints, ligaments and muscles. You can sprain ligaments, strain muscles, rupture disks, and irritate joints, all of which can lead to back pain. While sports injuries or accidents can cause back pain, sometimes the simplest of movements-for example, picking up a pencil from the floor- can have painful results. In addition, arthritis, poor posture, obesity, and psychological stress can cause or complicate back pain. Back pain can also directly result from disease of the internal organs, such as kidney stones, kidney infections, blood clots, or bone loss. 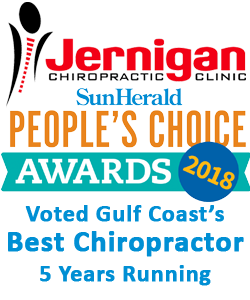 Dr. Jernigan urges you to make an informed choice about your back care. To learn more about how chiropractic may help you, contact our office today for a FREE CONSULTATION.....228-896-7574.